World Music Network have yet another new album out that just demands attention. This time it's The Rough Guide to the Music of New Orleans and ... wow! We're only in mid-March and this is already on my shortlist for my Top 20 Best World Music Albums of 2012! Killer! I'm a big fan of New Orleans music, style and sass anyway and this album's got it in bundles. It's a whole swag-bag of deeply phonky grooves, louche vocals and pneumatic bounce. There's funk, phunk and phonk by the palette-load, soul, rhythm and blues, hiphop, brass-hop, old school proper New Orleans jazz, latin jazz, soul jazz, boogie-woogie . . . and did I mention the funk? From the traditional torch-holders of Crescent City traditions like Dr Michael White, Earl King, The Meters and Professor Longhair, and living legends like Dr John, Big Chief Monk Boudreaux, James & Troy 'Trombone Shorty' Andrews and Kermit Ruffians to bands like the Hot 8 Brass Band, Dumpstaphunk and the New Orleans Nightcrawlers, this album just delivers from the off. As well as all that you've also got great tunes from Jessie Hill, Los Hombres Calientes and Jon Cleary & the Monster Gentlemen. Monster. In fact, this album is a Second Liners' dream: high-steppin', hooch-drinking, groove-driven music to turn your bones to rubber and your mind to endorphine-soaked mush - and totally legal too! 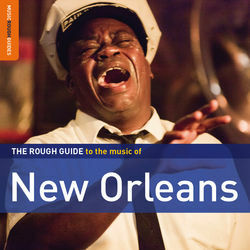 The Rough Guides always give you an overview of a genre, country or area; this one however drops straight into Jackson Square and hits the ground running in all directions at once. It's just fabulous. Very highly recommended indeed! All that and it also comes with a a free bonus 7-track CD by Dumpstaphunk! There are so many outstanding tracks, but if I had to just pick one then it has to be the dirty, dirty, DUTTY groove of Soul Second Line by the band Papa Grows Funk. Turn the volume up to 10, disconnect the phone and unplug your Reality Socket. Someone get me a cold shower! Release date is 2nd April 2012 from World Music Network. Get your order in now, coz this is definitely one to keep! Oh, and did I mention the phonk?